This is a story of our journey together during the various stages of her illness. In many ways it was not a pretty time. Yet, through this difficult experience, there were shafts of light from the One who understands all things and promises to be with us. It was His light that led me to dig deeper, furrow beneath His wings, and find His peace and strength in the storm. Through retelling personal stories, I invite you along on my journey. By sharing my close up perspective of this disease, you will enter with me into the eye of the storm but more importantly into the goodness of God. 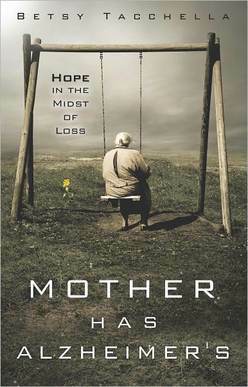 In the midst of the devastation of Alzheimer’s, God met me with encouragement, direction, comfort, peace, and even joy. You will see that a person doesn’t have to be healed in order for God to be glorified, that He’s all about the journey. I experienced victory in the midst of trial, opportunities to serve when serving was a test, the ability to trust when situations were tedious and perplexing, thankfulness when days were clouded with a heavy, oppressive fog. Overall, I found hope in the midst of loss in what became an adventure in God. I took Him at His word and was not disappointed. All glory to the Father! “But thanks be to God who always leads us in His triumph in Christ, and manifests through us the sweet aroma of the knowledge of Him in every place” (II Cor.2:14).